This bright, beachfront condo features an unobstructed view of Akumal’s pristine Half Moon Bay, a sheltered stretch of coastline on the Caribbean Sea, known for world-class snorkeling and small town tranquility. The water is clear, calm and shallow, making it is easy to appreciate the coral reef and its stunning array of marine life. The condo’s back porch opens onto a landscaped walkway leading directly to the soothing surf and white sand just a few steps away. At The Reef, you are surrounded by the rejuvenating ocean breeze and airiness of the space. The living areas all offer stunning ocean views with direct access to the beach through your private terrace. The open floor plan lets plenty of sunlight into the living and dining rooms, which are bright and welcoming. 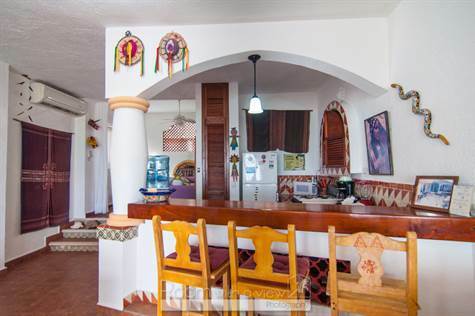 The kitchen is fully-equipped to prepare anything from a quick snack to a hearty Yucatecan dinner. The bedroom is spacious and furnished with a king-size bed. When you’re not actually in the water, the town of Akumal is a great place to relax and slip into the Caribbean lifestyle. The best cocktail bar in the area, La Buena Vida Restaurant and Bar is just a short walk away from your front door. Of course there are lots of options, including the gastronomic experiences of Tulum and Playa del Carmen; both just a short drive away. You and your guests will also be close to gift shops, grocery stores, ATMs and dive shops. This lovely condominium is a sound investment for a vacation rental or hassle-free getaway. Contact us today for more information!